If you dream about winning the lottery, does it mean you’re lucky day is soon to come? Lottery dreams. Winning the lottery in a dream can symbolize being lucky. Good fortune is smiling on you, and it doesn’t necessarily have anything to do with the actual lottery. People are said to win the lottery when they get hired for a coveted job, or marry the perfect mate, or have a wonderful family, or rise to the top in their profession. They get lucky, the few chosen from among the many, even when the luck is earned. Dreaming about winning the lottery can mean you’re working through in your mind how to be more lucky, or how to gain what winning the lottery represents: security, opportunity, resources, freedom, influence, importance, success, dramatic change, money. Lottery dreams are rarely about money directly, but instead about what it symbolizes. A lottery dream can be a “what if?” simulation. What if you actually won? What would you do, and how would it change your life? Dreams help clear impediments, such as the belief that nothing good ever happens to you. And they address side questions such as, Would winning the lottery change you and your life in bad ways? Would it be bad for people close to you? Are you better off where you are? Some people say that winning the lottery is blind luck, and others say that our consciousness creates our reality and our so-called luck. If consciousness creates reality, then improving and raising your consciousness is a direct way of improving your reality. Dreams are all about that. Learning from them puts you in a better position to win the lottery of life. I won the lottery when my manuscript was chosen from among many to be published. Playing the lottery can symbolize creating your own opportunity or luck. You create your own luck by putting yourself in a position to succeed. For example, an author (me) dreams about buying permanent lottery numbers. If the numbers come up in any future lottery, he wins. In the dream, he realizes he didn’t buy all the numbers he could have, and wonders how he would feel if someday he almost wins the lottery but comes up one number short. He resolves to buy all the numbers available. Since no lottery actually works that way, that part is obviously symbolic of something. The dream is about his efforts as an author. The high effort out into building an audience and drawing attention to his work, but he sometimes skips opportunities because he doesn’t think they will pay off. In dreams, buying something can symbolize an investment of time and energy, so buying permanent lottery numbers symbolizes putting the time and energy into maximizing every opportunity. One day, he hopes to “get lucky” and see his work go widespread. A woman dreams that she holds a winning lottery ticket and tries to read the numbers as people around her react with excitement and bewilderment. She wakes up thinking that maybe the dream tried to give her the winning numbers in an upcoming lottery drawing. But with more thought she realizes the dream is really about getting motivated to create her own success. In the dream she is distracted by the hoopla around her, symbolizing the distractions that keep her from fully applying herself to her work. 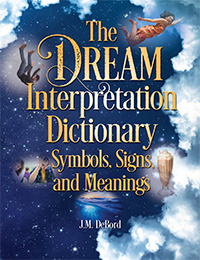 This post is excerpted from my book about dream interpretation. People have dreamed about winning lottery numbers, played them, and struck it rich. They have dreamed about playing ANY numbers and won. They’ve dreamed about playing scratch off games and won. They’ve even played the same numbers twice in the same drawing and won a larger share of a split jackpot because they followed an idea given in a dream. Then again, lottery winners have also played numbers found in a fortune cookie and won, so just dreaming about winning the lottery or about winning numbers is not a sure thing. But in some cases the coincidences are meaningful and too synchronous to be random—especially cases in which people who’ve never played the lottery wake up and say to themselves, “It’s my lucky day, I really should play the lottery,” and they win. Like this guy who won the lottery after dreaming about it. And this guy won the lottery after playing numbers he dreamed about. Synchronicity is the concept of meaningful coincidence, including the uncanny timing and arrangement of events. Synchronicity is behind some cases when money comes to a person at just the right time, such as when they win the lottery right after losing their job or when on the verge of financial ruin. To learn more about synchronicity, see Dr. Bernard Beitman’s website. As a side note, if you want to increase your odds of good fortune coming your way, I have a suggestion for you. Make the effort be about more than just you. I’ve noticed that good things come more often to people who are motivated by a desire to help more people than just themselves. Subscribe to my newsletter and I’ll teach you how to interpret dreams. Start now by clicking the banner to go to signup page. I will teach you how to interpret your dreams. Sign up for my newsletter “We Love Dreams” and receive emails with links to everything you need to get started. Free and 100% legit. Hi guys I dreamed last night it was random I won lottery of millions dollars this dream felt like real and went on whole night . When I woke up it’s real but strange thing is I don’t gamble or spend money in lottery because I don’t like . So this dream was so random. Is that good or bad? Any suggestions? Hi, I had a big delay in responding to you, but I do have an idea for you to consider. Think of winning the lottery as meaning you know you have everything you need in life. You are blessed by winning the lottery of life, meaning you recognize how fortunate you are. Measure in terms not of money, but who and what you are as a person and the circumstances of your life. Do you feel rich? I Had a dream of me looking through my eyes trying to figure out the combo to the safe. The energy was high, I could feel anxious w/ urgency to open it. My daughter behind me saying daddy you can open it I know you can. I also had some older friends there also. I tried several different combinations & to no avail. I gave it one more try. I dialed 9-5-6 or 9-56 mmm dont remember exactly but I heard the the safe unlock. I turned the handle & opened it. My daughter & friends were excited. I looked inside & saw a note book. I was on one knee reached in grabbed the book. Mmmm this is a list of names. I looked at the top , it said lottery winners. A list of names in numerical order of who will win. I start looking for my name as I gaze towards the bottom. I don’t see my name. Then I go towards the top & there I am #48. I relise I’m going to win. All my Financial worries will be gone. So I ask myself when is this going to happen& how much. So I continue looking up the paper and notice there are peoples names crossed off and my name is not. Mmmm. So I look and notice there are two peoples names before mine that are not crossed off. I say I’m the 3rd person going to win. As I look on the notebook it just gives names of the winners. Does not tell you when or how much you will win. So I have written this dream down in my journal & have been asking myself all the different meanings of my dream. As you know from reading my post, most lottery dreams are symbolic and do not foretell a future win. However, your dreams is giving you encouragement. It’s showing your motivation for the best future you can create for your daughters. The part about letting go of the past…yeah, good idea. So much of what we believe about our luck or fortunes is self-fulfilling. I have learned deep lessons with this subject. If it was my dream, I’d walk away with the confidence that I can get lucky and that somewhere my name is on a list of winners. Question is, winners at what? The game of life? If you do win the lottery, I’d love to know about it. Some lottery dreams really do come true. Mr. DeBord, I dreamt that my colleague won 2.2 million dollars in the lottery. Earlier in the week, I had a dream about 2 golden retrievers, that were chasing each other. They weren’t growling at each other, but I’m unsure if the chasing was playful or not. What is the connection between the lottery, my coworker, dogs, and the number 2? Thanks so much for your help! Hi Kylah, I wish I could say you’re about to win the lottery, but I think your dream is using number 2 in a symbolic sense. Two is the number of duality. Duality is ingrained in our existence, even in the very atomic structure of the universe. Oftentimes we are not aware of the “other” who exists alongside us — the other “you.” Call it the inner you, your invisible self, or the unconscious mind. Our existence as human beings is shaped by this relationship between the “you” that navigates through conscious life and all its complexities, and the “you” that remains in the background. I’m born under the sign of Gemini and have other “dual signs” strongly represented in by birth chart, and it doesn’t prove anything but I tell ya, it’s uncanny how I feel like I’m living two lives. Back to your dream. The co-worker might be used by the dream simply to symbolize the idea of “work together.” In other words, if you can get your dual nature to harmonize you will reap a big reward. It’s a basic idea taught in many spiritual traditions, yet it’s not an easy thing to do, generally. A gap must be bridged. Differences in perspective and priorities addressed. Bargains and compromises. The retrievers make me think of “retrieval,” and when applied to personal development (a core desire played out in all meaningful dreams) it means “retrieve something essential about myself that’s not with me in the present.” In some traditions it’s called soul retrieval. Psychology has terms for it like “reintegration.” I like to simply think of it as hey, even a good life can be rough and essential parts of oneself get dinged up.” Once everything about you is brought into the present, you can live more fully. And that leads to having more of what you want from life. You win. That’s my best guess. I encourage you to open a notebook to a blank page, grab a pen, and say inside yourself “I’m listening.” Hold the pen and just let the conversation begin. I hope my ideas help you understand the dreams and their importance.